The Samsung Galaxy C5 boots up with Android 6.0.1 Marshmallow with TouchWiz UI on top. The latest available version of Android bundles cool features like native support for an app manager, Doze mode, and Google Now on Tap among other tweaks. Plus, Samsung has gotten to a point where its interface looks quite refined. The UI on the Galaxy C5 also brings the clutter down to a minimum with less bloatware and everything is neatly organized. The lockscreen is the typical Samsung deal and offers swipe to unlock and a pair of quick shortcuts on the bottom. The fancy always-on display from recent flagships is missing. Both the Galaxy C5 and C7 are also equipped with fingerprint readers. They reside in the home button, as is typical for Samsung and work as reliably as the ones found on the company's flagships. The unlock speed, however, feels just a bit slower on the Galaxy C5 than it did on the C7. Regardless, both phones recognize a print in less than a second, and while we have seen a lot faster readers out there, Samsung still has impressive accuracy on its side, which streamlines the overall experience. The fingerprint reader, however, is not always on. Rather, to unlock the phone, you have to press the Home key and leave your finger for a moment longer while the fingerprint reader does its thing. 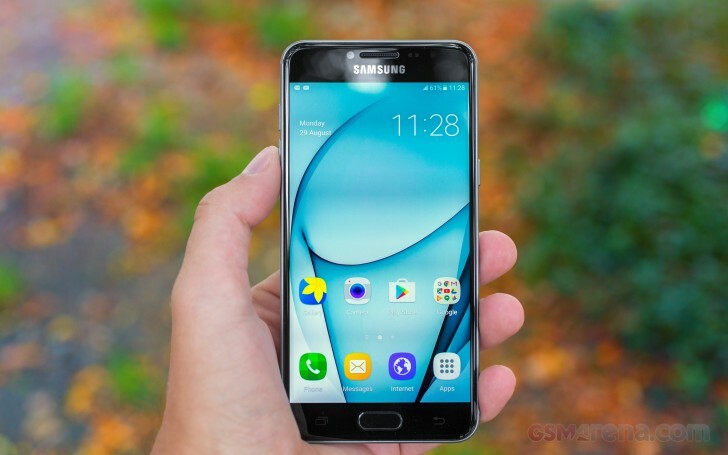 The Galaxy C5 homescreen is identical to the TouchWiz home of other Samsung phones. You get plenty of extra home screens which tend to pile up to the right of the main one. However, the title of "main" can be reassigned to another one, leaving you with a more old-school "swipe both ways" interface. If you decide to leave it be, swiping once to the left opens up a Briefing interface for quick news consumption. As for organization, Samsung has you covered with color-coded folders both inside the app drawer and on any home screen. The Notification area is pretty busy by default. It starts with a scrollable line of quick toggles on top, then a brightness slider; then the Quick connect button. Everything can be rearranged from the Edit option. Don't like the default look of TouchWiz? No problem, as the Galaxy C5 user interface is fully themeable. We only got the default theme pre-installed, which is great if you don't intend on using the feature. But otherwise, the Theme Store has you covered with many more to download. Multitasking has also come a long way, especially on recent Samsung devices. Advanced features that were once only available to Note users have been trickling down steadily to other parts of the company's lineup. On the Galaxy C7 and even its lower spec C5 sibling, you can pretty much do every split screen and floating app trick that a Galaxy Note would allow, lacking only the S Pen magic. You do, however, have to know where to look for the split screen UI as it's not immediately apparent. Supported apps will have a Split screen icon in the App Switcher, or you could press the Menu key for a bit longer. Once you launch the Split screen mode, you can even drag and drop content between apps. You can also collapse either app into a floating, resizable app window. Overall, the latest iteration of TouchWiz manages to remain feature-rich, while also being reasonably light on resources. As a result, it runs without a hitch on the Snapdragon 617 chipset inside the Galaxy C5. Speaking of which, follow us onto the benchmark section of the review.